Besides being free, perhaps the command line is another important reason why lots of people starts using Linux. So here's 25 basic linux commands for absolute beginners. First you may feel that using command line is tough, but in reality it will take just a day or two two get started with the linux basic commands. Most probably you already know how to open up the terminal to type commands, so I'm skipping this part. Let's get started. Now we'll discus about some basic linux commands with examples, you're almost always going to need those commands, so better to remember them. However from my experience, it's much easier to remember if you write them with pen on paper, rather than just typing on terminal. This command prints the location of your current working directory. It's important to know actually where you're before going to a parent or sub directories. ls is one of the most used basic linux commands, used to print contents of a directory, by default it lists contents of current working directory(pwd). Example, use ls /usr/bin to list contents of the /usr/bin folder. After knowing your pwd and getting an overview with the ls, it's time to move around with cd command. Clarification, assume you're on your Home directory, you need to go to the /usr/local/share/fonts directory, use cd /usr/local/share/fonts. There's three shortcut, if you need to move one directory up, use cd .. and go straight to your Home folder with cd , and use cd - to go back to your last working directory. It's used to print the contents of a file to the screen(stdout more precisely), really useful when you want to have a quick look on contents of a file. As example, use cat a_text_file to get the inside contents of that file in your screen. cp , You can copy files and directories with this command. Typical usage is like cp file_a file_1_copy or cp directory_a dir_a_copy Also don't forget to use proper path when you're coping something to different location. The mv command is used to move or rename directories and files. To rename a file use mv old_name new_name, more details about mv here and here. The rm command is used to remove directory or files. Like use rm -r /tmp/backup to remove everything that folder. Of course you've to be careful before removing anything. mkdir, it's used to make a new directory in linux. Example, use mkdir my_new_dir to make a new directory named my_new_directory. The -p argument is useful, when you don't want to make parent directories manually. rmdir, if you need to remove a directory, use this command. As example, use rmdir my_dir to remove that specific directory. More details about the rmdir command here. touch, It's the equivalent command of mkdir for files. You can create a blank file with touch command. As example, use touch ~/Public/index.html to create a blank index.html file under the Public directory. This command is used to make link between files and directories. As example, you need to make a symbolic link of the /var/www directory to the /tmp directory. You've to be extra careful with complete path and trailing slashes while linking and un-linking. sudo , that's an essential yet potentially dangerous command. Whenever you're getting a Permission denied, Authorization failed or something like that use sudo. This will print the first 20 lines of the rsyslogd log to the stdout. By default head command prints first 10 lines. It's similar to the head command, but the function is opposite, prints last 10 lines of any file by default. Here's an example, how to print last 30 lines of the kernel log. It's also a very important command, used to change file and directory permission. As the chmod command is a very long topic, so here I'll explain it in brief. Basically there's three type of permission, read, write and execute. Each of them denoted by a number. There'll be a full chmod tutorial very soon, to explain you in detail. You may often need to check if a file tempered with or not. However md5sum is not the safest, but no doubt one of the most used. The long string of numbers and digits is the md5 hash of that particular file, just match first and last two characters, that's enough. The basic command to find files and directories in Linux. As it's a database driven command, so for the first time you need to build the database, run sudo updatedb and wait for few minutes. A typical example to locate something could be like below. It supports wildcards, and use the -i option to ignore upper/lower case. This command is used to check disk space usage on a linux system. The most common usage is like below, used along with the -h flag. If you need to quickly check disk space usage of a file or directory, the du command is here. Or could be like below for a entire directory and it's contents. The -s flag is used to suppress unnecessary clutter and -h flag is to make the output more human readable. The free command is used to display amount of free and used RAM in the system, also prints the swap space stats. Again, the -h flag is used to make the output easier to read by humans.You can read more here, check linux memory usage with command line tools. No doubt you often need to create and extract zip archives, here's the zip and unzip commands for that. Most probably these commands are not pre-installed, install them with apt in Ubuntu. When the -9 option is used, zip attempts maximum compression on all files and -r option is for recursive archiving. You might want to read about another archiving tool here, 7zip linux command examples. 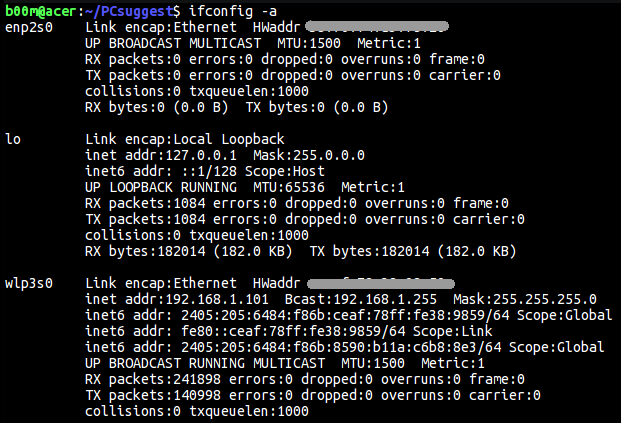 ifconfig stands for interface configuration, and it can do many networking related things, literally. Some basic use for beginners could be like checking which network interfaces are connected and their respective IP address. Or you can find out how much data passed through a specific interface, all could be done just by running the ifconfig command. This command prints some basic information about the system, like OS name, kernel version, host name, system time, OS architecture and so on. The above command prints everything it can, see the man page for more info. As the name suggests, history command prints a list of previously typed commands. Very useful when you're trying to find what you've done wrong before. You can also quickly find previously typed commands by pressing the Ctrl + R key combo. The command to find details about other commands. Almost every command has their respective man pages, useful to get a quick over view of an unknown command, use it like man any_command . We're not done yet! How you can shut down and reboot your system through command line? shutdown -h now to power off immediately. shutdown -h +10 to shutdown after 10 minutes. reboot to reboot the machine immediately. You may need to use sudo with the command above, depending on your current user id. Another thing important note is the modern shutdown command is a symbolic link to the systemd init daemon. So that's all bout basic linux commands, hope you enjoyed this very long yet useful tutorial(bit boring too). If you've any question or suggestion about the commands above, then please feel free and leave comments. Thanks for that clearly explanation.